JAYAPURA (Papua) • A plane that crashed in eastern Indonesia was yesterday found "completely destroyed", with the bodies of all 54 people who had been aboard amid the wreckage in a fire-blackened clearing at a remote site in dense jungle. Rescuers reached the debris of the Trigana Air plane, which went down on Sunday during a short flight in bad weather, after being forced to abandon search efforts a day earlier because of the mountainous terrain and poor weather. "The plane has crashed; it is completely destroyed," search and rescue chief Bambang Soelistyo said of the ATR 42-300 after rescue teams reached the site in Papua province yesterday morning. "Everything was in pieces and part of the plane is burnt. We could see burn marks on some pieces." Photos of the site showed a fire-blackened clearing in thick jungle strewn with debris. The twin-turboprop plane was carrying 54 people - 49 passengers and five crew - and officials said all the bodies had been found among the wreckage. Some bodies were not intact, and others were badly burnt. The black box flight data recorders, which could provide clues about the cause of the crash, were retrieved. The devices should provide clues about what caused the crash, which officials believe was likely due to the weather. The harsh conditions meant the authorities were planning to lift the bodies from the site by helicopter, the search and rescue agency said. 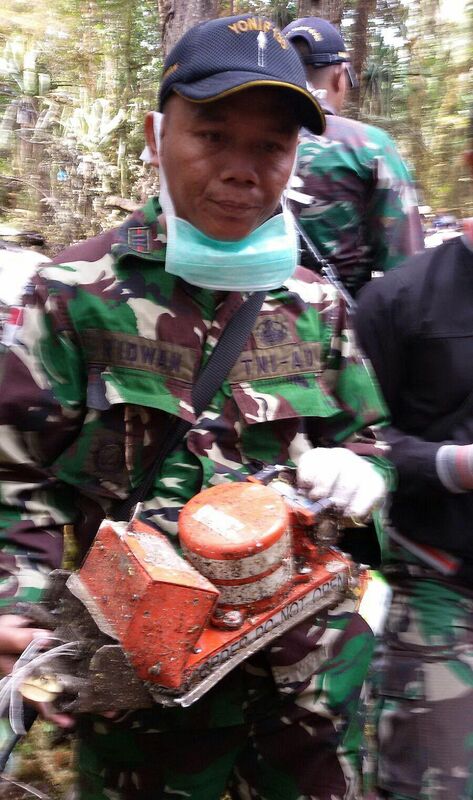 Money - some of it burnt - was also found among the wreckage of the plane, which had been transporting 6.5 billion rupiah (S$663,000) intended for distribution to poor families as social assistance funds. "The challenge is the weather - it changes from good to bad very fast and it's very cold now," said Captain Beni Sumaryanto, Trigana Air's service director of operations. A team of about 100 rescuers, including personnel from the military, police and search and rescue agency, were at the crash site, the Transport Ministry said. Thick fog and rain had hampered attempts by more than 250 rescuers and 11 aircraft to reach the wreckage on Monday. The plane had set off from Papua's capital Jayapura on what was supposed to be a 45-minute flight to Oksibil, a remote settlement in the mountains. But it lost contact with air traffic control about 10 minutes before reaching its destination, soon after the crew asked permission to start descending in heavy cloud and rain to land. Captain Sumaryanto said "unpredictable weather and mountainous terrain" had likely caused the accident, adding that the plane was in good condition and the pilot was experienced. Small aircraft are commonly used for transport in remote and mountainous Papua and bad weather has caused several accidents in recent years. Last week, a Cessna propeller plane crashed in Papua's Yahukimo district, killing one person and seriously injuring five others on board. Officials suspect that crash was also caused by bad weather. The doomed aircraft made its first flight 27 years ago, the Aviation Safety Network says. Trigana Air Service has a fleet of 14 aircraft, aged 26.6 years on average, according to the airfleets.net database. Indonesia has already had two major crashes in the past year. In December, an AirAsia flight went down in the Java Sea, killing all 162 aboard. More than 100 people died in June when a military transport plane crashed. Indonesia scored poorly on a 2014 safety audit by the United Nations aviation agency largely because its Ministry of Transport is understaffed, said two sources familiar with the matter, as the country struggles to cope with the rapid expansion of air travel in the sprawling archipelago.